Tie looks great! Perfect width. All ties are in stock. A tie is a fashion accessory that gives you the opportunity to be creative and express your personality. Especially when you combine it with a sharp looking tie-pin. Find all our colors, widths and material selections below. Scroll all the way down for some awesome, useful information about ties. How far down should a proper tie hang? Throughout history, ties have been worn at different lengths, depending on the edicts of each era's prevailing fashion. Today's sweet spot is just at the top of or halfway down the belt. Many men mistakenly believe that the modern look is all about narrow or semi-narrow ties, but there's a rule of thumb that says the width of your tie at its widest should be the same as the width of your jacket's lapel. See the illustration below. Apart from a tie's appearance, there are other things to consider when deciding which one to wear. We've tried to make your life easier by including information about the materials our ties are made from. Silk is a soft, lustrous fibre produced by silk worms. This natural material makes the tie drape perfectly where it hangs. 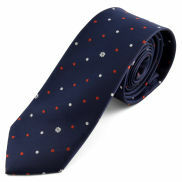 Silk ties have unique colors and reflect light beautifully. Silk ties can be ironed but at the lowest heat setting only. 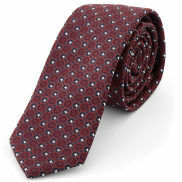 On average, silk ties are more expensive than ties from other materials. Silk is less resistant to water and stains. It's better to store silk ties in a rolled up coil than on a tie rack. Polyester is resistant to both water and stains. Very resistant to curling up. 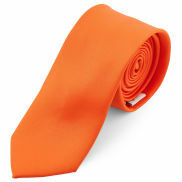 Polyester ties are less delicate than silk and hold their colors well over time. Much less expensive, costing as little as half of what you'd pay for a silk tie. Unlike natural materials, polyester doesn't breathe, so on hot summer days you might get a damp and sticky feeling around your neck. Polyester absorbs odors such as smoke and sweat. Polyester doesn't wrinkle, which is a good thing because it doesn't like heat, especially from an iron. Natural cotton is a material that breathes well, making it suitable throughout the year. can easily lose its shape and curl upwards. Flax is a fluffy material that even a small breeze will ruffle. Being natural, it breathes, so it's ideal for summer ties. Although relatively strong, flax is likely to curl more easily. Either woven or knitted, wool ties drape very well. There are many qualities of wool available but the higher-end ones, such as cashmere wool, can be a little pricey. Because of their natural warming properties they're more appropriate for the cooler times of the year.